– Contradiction, inconsistency and disintegrity cannot create True Unity. – Trying to force and coerce “unity” through contradictory Moral Baselines is not unity, integrity, harmony or consistency. – You cannot have true moral unification if there is contradiction. – Coercive false “unity” leads to a conflicted internal state of being due to sacrifice and compromise of a Foundational Principle of Moral Truth. – Uniting in Moral Truth allows us to create a real, lasting, effective future of True Freedom and Peace, in our localized area of living, and expand it. True Unity is standing in that common Moral Foundational Truth. 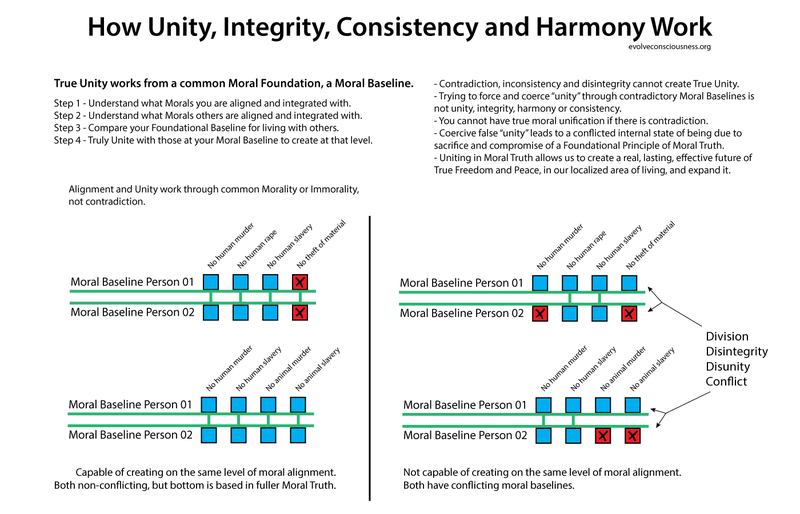 Moral Foundational Truth is integrity, unity, harmony and living connected to morals and values. Alternately, you could not Care for Truth and Morality, and instead compromise your Moral Baseline for living in order to falsely “unite” and create more of the same, allowing more evil to be accepted through your false attempt at “unity”. Most people want this illusion of “unity” through a disintegrated, inconsistent and disharmonious Moral Baseline. You either stand in Truth that Unites. Or you stand in the falsity that divides itself from Truth. You either stand in the same Moral Baseline with others capable of creating at the same level of Truth, Love, Good, Right, Morality, Natural Law to form a True Unity. Or you compromise your ability to create that reality by accepting the immoral actions of others to form a false “unity” because they do not want to stop perpetuating those immoral actions, and you are OK with that. You will “unite” and let them create evil because Truth and Morality don’t matter as much as the blind “unity” espoused by pseudo-spirituality. People want to “connect” and “unite”. It is a deep yearning. But failure to recognize the supreme value and importance of Truth will not allow you to reach the goal you purport, of True Freedom and Peace, through these false “unities”. People are holding themselves back from where they say they want to go. We are all in this together. But we are relegated to interaction and cooperation based on the common foundational points that exist, while allowing immorality to continue. This is not True Unity, but false or blind “unity”. We cooperate, live with and interact with others who violate morals we live by. We live in constant disharmony and disunity with others, and we expect blind “unity” to work. What a joke. This creates internal conflict to coerce ourselves into accepting immorality around us. If morals matter then they all matter. Otherwise, if you want to unite regardless of moral unity, then let’s just go and “unite” with the elites and any other violator of Natural Law Principles of Truth. Yes, that will really work out well to create into the future while allowing those actions to continue. Wonderful idea.